Your credit score tells the world a lot about you. It tells creditors if it’s worth it or not to lend you money and at what rate. And like it or not, employers use your score and based on that number alone often decide if you are trustworthy, responsible and ethical or not. And this is just the tip of the iceberg. There is no doubt about it; your credit score has a huge impact on your financial life. But how is it calculated and by whom? These are really useful questions to answer. Let’s get to it. There are 3 or 4 large financial institutions that keep tabs on your every financial move. They use that information to score your credit and then they sell information to you and your would-be lenders. Each of these companies have different scoring methods and results. But for our purposes, let’s consider your FICO score provided by Fair Isaac Corporation. I suggest this because your FICO score is used by over 90% of all creditors, they dominate the industry and they’ve been in this business since 1958 – longer than anyone else. 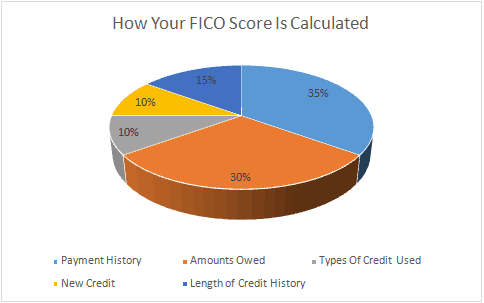 How Does FICO Tally Your Credit Score? While the pie chart above presents the general weight the company assigns to different areas of our financial lives, the actual weight of an item can shift depending on your particular situation. Of course both your positive and negative credit history is considered. For example, if you have a charge-off because you never paid a certain bill, it will cost you points. Then, if you make payments on time to other creditors, it adds points to your score. Also, the older the history or event is, the less impact it has. Look again at the pie chart above. Consider the five areas and their relative weight. I mentioned above that the importance of each area shifts depending on your situation. The actual weight that any factor has depends a great deal on what else shows up on your credit report. For example, if the only credit you have is from credit card companies, the relative weight of each of the five factors changes. On top of that, as you take steps to improve your score, the relative importance shifts further. For that reason, you have to look at your entire report (rather than just the score alone) in order to understand how any one financial event might impact your number. And keep in mind that no matter what your credit score is, lenders and employers also look at how long you’ve had your current job and other factors before they make a decision to do business with you or not. What creditors care about is being repaid. That’s it. And that’s why payment history carries the most weight. If you have a few late payments, it won’t sink your score. And a perfect payment history doesn’t guarantee the highest credit score either. It’s just a very important piece of the puzzle. When it comes to late payments, FICO considers how late the payments were, the amount, the frequency and when these late payments occurred. Many people have debt. Just because you owe someone money doesn’t mean it will hurt your credit score. What FICO looks at is the amount of debt you have compared to the amount of credit you have. For example, let’s say you have one credit card with a limit of $10,000. If you owe $1,000 on your card, your credit usage ratio is 10%. If you owe $9000 on that same card, your ratio jumps to 90%. The higher the ratio, the more risk for the creditors. That’s because as you get closer to the maximum allowed credit limit, you may become overextended and unable to make your payments. Having credit accounts and owing money on them does not necessarily mean you are a high-risk borrower and that you’ll end up with a low FICO® Score. But this part is tricky. Even if you pay off your credit cards each month, the “balance” is figured based on the last amount owed – again, even if you paid it off. What kind of debt has a balance owed? How many accounts have balances? If you have installment debt, how much has been paid compared to the starting balance? Since a lower credit utilization is better than a high one, many experts suggest that you open up many small accounts, run up small bills and pay them off. But be careful before you do this. While it is probably smart to keep your existing accounts open, use them and pay them monthly, if you open new accounts just to keep your credit utilization low, you are probably looking for trouble. How long you’ve had credit is important to future creditors. The more history you have for them to review, the safer they feel. That’s because if you have a long history, they figure any sketchy credit behavior will have already surfaced. But if you don’t have much credit history, don’t despair. You could still end up with a fine FICO score if the other 4 factors are strong. In determining the length of your credit history, FICO reviews how long you’ve had each account, when you set up your latest account and when you last used each accounts. These people are thorough. There are many different sources of credit and FICO looks at how you mix and match them. For example, you might have credit cards, retail cards, installment loans and mortgages. You don’t have to have a broad array of credit sources but if you don’t have any credit card history, it’s going to bring your score down. All things being equal, it’s better to have a variety of different types of credit accounts. But don’t open an account if you aren’t going to use it. It won’t help you. And just because you close an account doesn’t mean the history attached to that goes away – it doesn’t. If you want to keep your credit score as high as possible, don’t open up a number of new cards all at once. Historically, people who do that are a big risk. Creditors don’t like it and neither does FICO. While we’re on the subject of new credit, let’s discuss credit inquiries. A credit inquiry happens when a potential lender runs a credit report on you. Many people fear that too many inquiries hurt their score but it’s probably nothing for you to worry about. FICO only considers those inquiries made within the last 6 months and they ignore many kinds of inquiries all together (such as when you shop for the lowest-cost rate on a major purchase). It’s difficult to dissect your number and know exactly why you have the score you do. But it’s easy to know what to do if you want to keep your score as high as possible; pay your bills on time, don’t keep large balances, establish a long history by holding on to older cards and using them occasionally (but remember to pay them off immediately) and don’t open a credit account if you aren’t going to use it. Do you know what your credit score is? Do you know why you have the score you do? What are you going to do to improve your score?